We've had mice setting up housekeeping in our garage many times. There are no cracks for them to get in other than through the doors being open. Sometimes we wonder if they stake a lookout and wait till we're out gardening and make a run for it. We can tell they're in there when we pull something out like an old garden boot to find it filled with sunflower seeds. Storing up for a long winter. We wouldn't mind them being out there, but it's no place for mice. They like to chew anything for nesting materials and one time they built their nest under the hood of the car. Fortunately they weren't in there when we found it. They seem to make many nests in the area. I guess they are part gypsy wanting to roam about and sleep where ever they get tired. We have a humane trap that we use and the best temptation for them seems to be some whole wheat bread with real peanut butter on it. I guess we attract the health nuts of the mice world. It gets them every time. In the past week we have caught and released 4 deer mice. We always spend time looking closely at them to be sure it's not the same one coming back in. This week it's been easy to notice they are all different since not much time has passed since we saw the last one. Deer mice are an important link in the food chain because, when abundant, they are a major food item for a variety of predators. For example, at times owl pellets have been found to contain more than 40% deer mice bones. They are cute little things, but their poop can be extremely toxic, so be sure to dispose of it quickly and carefully. If there's huge quantities of it, you could get a virus by breathing because deer mice are the primary carriers of the hanta virus. The hanta virus pulmonary syndrome was first recognized in 1993 and, since that time, a total of 131 people have been reported to have contracted this illness in the United States. Of those affected, half have died. In 1996, two South Dakota men were diagnosed with hanta virus. As of 1996 there was no cure for the disease. For this reason, it is recommended that people do not handle wild mice or frequent areas where large amounts of mouse droppings are found. It appears that there was a Mom that had some little ones. We've already noticed that some of the popcorn we tossed out, to see if there was another one about, has been eaten. So, tonight the trap went down again to get #4. Litter size varies from 1 to 11, with typical range being 4-6. Goodness! We could be busy for awhile. I have an Auntie in PA that has mice visitors and she traps them and releases them also, but they have a way back in at her place. I think she likes the company and those cute little mice grins. Not everybody thinks mice are cute since most of us have been trained to scream and run with the mention of the word. But, they are animals and deserve a life. They serve a great function for us and especially for the owls and wildlife that rely on them for food. 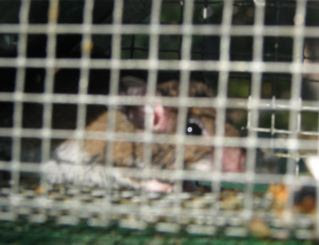 So, if you have to get a mouse or mice out of your home, please consider doing it humanely. Here's a link for more ideas on how to rid your home of mice humanely. 12/15/07 - Update: We trapped and released 7 of them. It's important to get them all because they can begin reproducing at 7 weeks of age and they produce year round.